This somewhat curious, yet quaint Spanish-Mission style structure stands in the Kershaw County town of Camden. 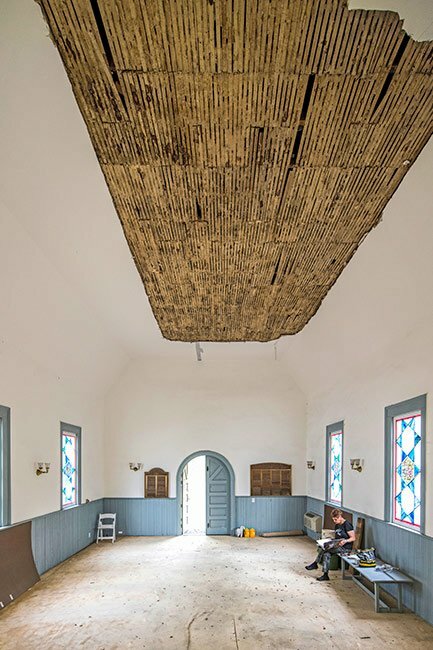 A rare form of architecture found in South Carolina, the building was constructed in 1903 and initially served the St. Mary’s Catholic Church for nearly two decades until its congregation outgrew the building. The church was sold in 1921 to the Hebrew Benevolent Association and became known as Temple Beth El. The statue, seen outside of the temple in the photo below, is of the double star of David and was created by Allan Sindler, a Jewish artist once residing in the area. The symbol is a generally recognized symbol of Judaism and God’s protection. 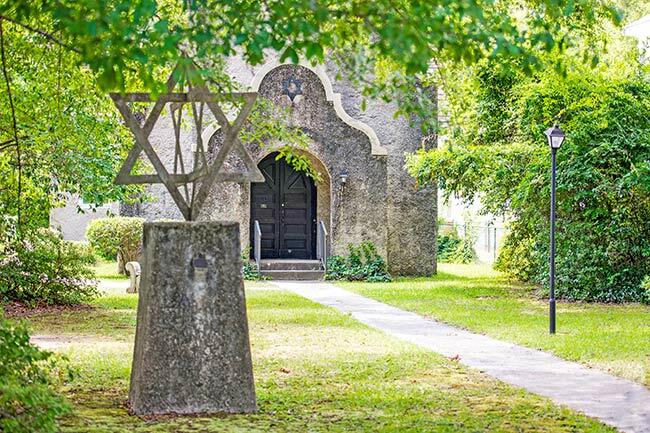 Charleston was the landing place for South Carolina’s first Jews during the late 1600s. Similar in story to the Quakers and Huguenots, the Jews sought religious freedom, a proposition the English extended to anyone willing to relocate to the new colony. By 1730, nine townships were formed by South Carolina’s government with the intent of settling interior parts of the state, including modern-day Camden. Most of the area’s first settlers were Quakers and Scots-Irish but by the 1780s, Jewish people, as well as Catholics started migrating from Europe, as well as other cities in South Carolina, to Camden. The Hebrew Benevolent Association initially owned an empty lot on nearby DeKalb Street where they were planning to build a temple. Debates over its use went on for years until the property was sold. The association then became aware of the empty St. Mary’s Catholic Church and settled on establishing a house of worship here. 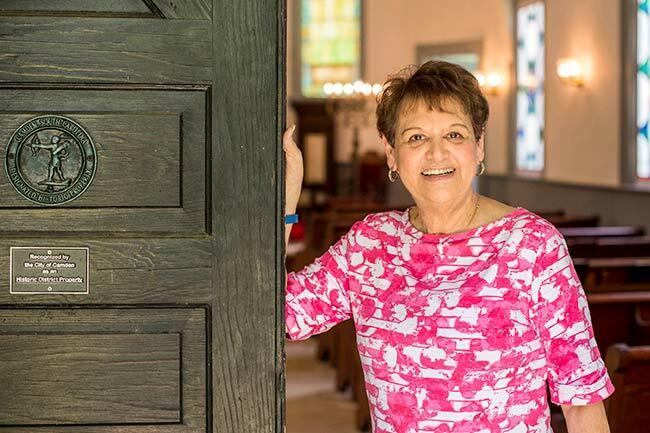 For nearly a decade, the congregation was served by Rabbi F. Hirsch, of Sumter, who would travel to Camden two Sundays a month to lead services. The Sunday school was not operational every service as the Jewish children received some education here but also traveled to Sumter for confirmation classes at Temple Sinai. When the Hebrew Benevolent Association purchased the building in 1921, their expectations were that the congregation would continue to grow. By 1927, the temple served over 100 members but ten years later, that number dropped to 67. By the next decade or so, that number dropped to around 25 and today, only 11 members are left. When Bill Fitzpatrick, long-time friend of the Picture Project and the photographer who captured the beautiful images found on this page, wished to take a class from his church, Our Lord of Perpetual Help Catholic, to learn the traditions of Passover and other rites and rituals that the two faiths had in common, he called congregation member, Barbara James, seen above. James was happy to oblige but when she arrived at the temple on Good Friday, she discovered an extensive mold issue caused from a leaky roof that left the interior exposed to heavy winter rains. Thick black mold covered the walls and ceiling. Since the temple is only used twice a year; once for Rosh Hashanah and once for Yom Kippur, it is unknown when the damages would have been noticed had Fitzpatrick not made that phone call. The mold that once covered the walls and ceilings of the temple has been eliminated and the interior, restored. 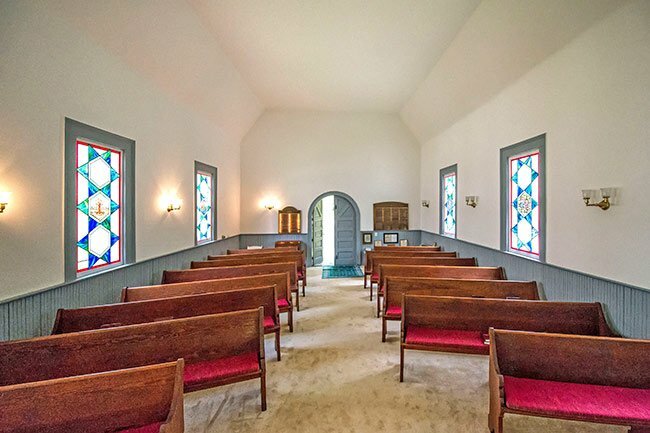 Hello, in the article it explains that the sanctuary was sought out for a visitation from a church of a different religious faith. The temple was opened and it was discovered that there was a lot of damage, which is why you see the varying scenes on the interior with seats and not, it was in the process of renovation. I am confused about the images, the third seems to show the sanctuary with seats, the 2nd shows the sanctuary empty, please explain. Also, I am confused about whether the building is still used as a Jewish synagogue? Why only two times per year? It seems odd to refer to Christian holidays in the context of a Jewish house of prayer. Thanks for your explanations.